This year, we as NETRONIC and I personally attended both NAV Directions in USA (San Diego) and EMEA (Poznan). The purpose of our attendance was both learning (by visiting the sessions and networking with many NAV community members) and channel enablement (by meeting existing and potentially new partners for our visual scheduling add-ins). Returning from the Poznan event, I asked myself: "what did I learn at NAV Directions and how does this impact the business of my company?". This blog post shares these thoughts with you. We all have heard the message "on" (Azure) and "in" (Office 365) - this year added by "with" (CRM) - more than one time. To me, this message has kind of three layers, of which the third layer created this year's 'aha!' effect for me. Of course, the first layer is the marketing message and Microsoft offering its partners a complete suite of business productivity apps is a strong message to me (even if I as non-selling ISV have no direct stake in selling NAV licenses). The second layer is the technology investment that Microsoft made over the past years to bring its offerings closer together, and to allow the integration of the various office and enterprise applications. 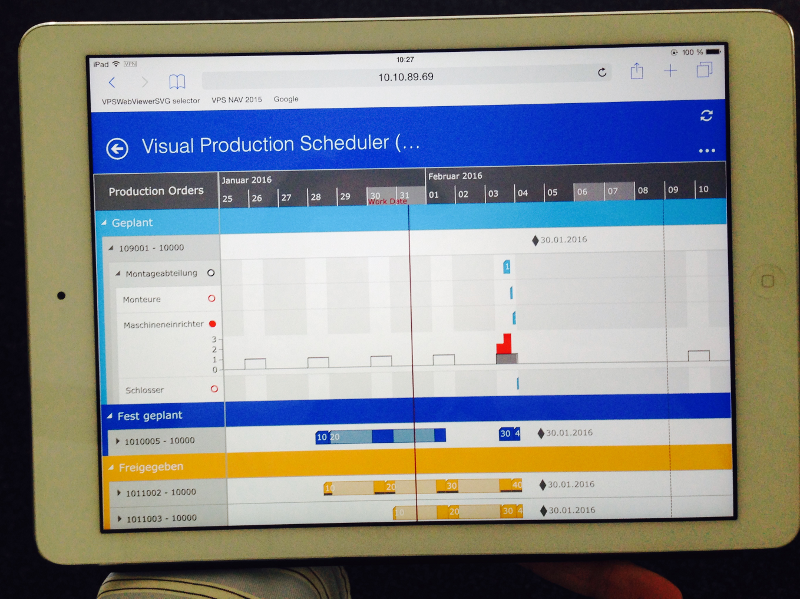 This year, the third layer of this story unfolded: the Dynamics NAV 'tablet client', i.e. the NAV app which is available for all major mobile operating systems (not just for Microsoft's own). As such, NAV users have the opportunity to benefit from a seamless user experience - across the various business productivity apps, but also across the various devices (Windows PC, browser, any tablet). Honestly: I think having a seamless user experience across heterogenous apps and devices is a very strong value prop (and this was my aha! effect). But wait a moment: what does this mean for a small non-selling ISV like us? Watching the keynote presentations, I expected something to happen like the big "NAV on tablets" show. Hence, initially I was very suprised that a relevant amount of time was dedicated to rather technical demos like the new capabilities for merging objects. Digesting this demo and the inherent content further, I felt that these new capabilities are a major (and yet missing) puzzle piece in the route-to-repeatability approach that Microsoft wants its partners to take. The more the channel is expected to build a repeatable (and scalable) business, the more the channel depends on tools helping them to deliver software products opposed to highly customized solutions. This is much enabled when users 'naturally' work on the same platform, i.e. on the same software version, rather than that each customized solution is highly dependent on a specific (legacy) version of the underlying platform. As such, the focus on the 'objects merge' capabilities makes big sense: they help partners to ease the upgrade process and to keep users on the always current version. To me, this feels like an important efficiency enabler. So: How do we fit into this scenario? 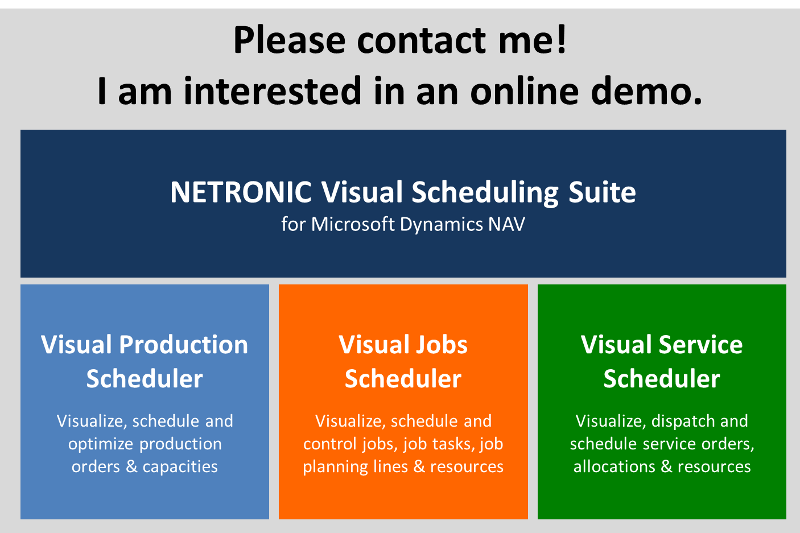 Hence, I was able to make a broad statement in our ISV session in Poznan (see the slidedeck here): if potential partners want to test the Visual Production Scheduler or the Visual Jobs Scheduler for Dynamics NAV, they can drop us a note, get an installer file and are ready to go in less than 30 minutes. Yes: less than 30 minutes to implement an external ISV product in any (standard) NAV environment, see the data from the Cronus database (or any other demo database) and start visually planning production orders, capacities, jobs, job tasks and resources. I feel, that this is very efficient, and that we are well prepared helping partners to build a repeatable business! And just in case you feel you missed the chance to meet and discuss. It is not too late: click the image below and we can set up an online meeting asap. PS: Cool anecdote. 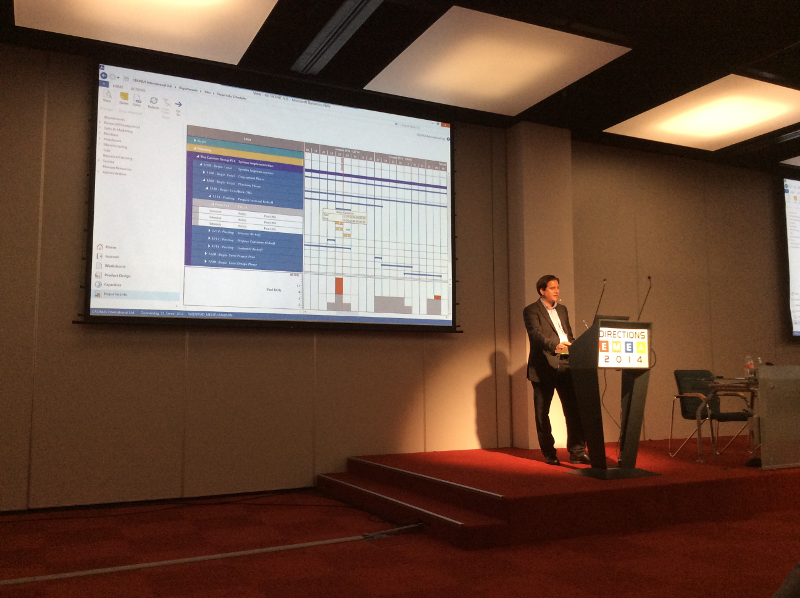 When driving home all the way from Poznan to Aachen in Germany, we received an email from a partner who visited us at our booth and sold our brandnew Visual Service Scheduler after the meeting.